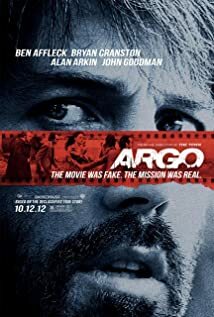 Argo is a cunning, fate and luck all come together in this gripping true story about six american diplomats hiding out in Iran after the fall of the Shah during the Islamic Revolution, and the subsequent U.S. hostage crisis of 1979, and an on-again-off-again CIA mission to get them all out alive. The review has to begin with Ben Affleck who stars in a low-key performance while also directing; John Goodman, Alan Arkin and the full cast provide strong support, though the script seemed to focus less on the actors and more on the tenor and mood of the moment. Using newsreel footage mixed with recreation, Affleck does a good job capturing the revolutionary zeal of an angry nation about to boil over. We follow the fall of the American Embassy in Tehran, just moments after six members of the american staff slip out a back door and find sanctuary in the home of the Canadian ambassador. With the new regime cracking down on everyone trying to leave the country, the CIA and U.S. State Department struggle with one bad idea after another in search of a plausible scenario to get the — now — fugitives out. At the same time, the Administration struggles with the potential political and international fallout scenarios should the mission fail. Loosely based on former Central Intelligence Agency operative Tony Mendez‘s historical account of how he and the Canadian ambassador attempt to pass the six off as a Canadian film crew; where things don’t go off exactly as planned and everyone’s lives hang in the balance. Not as much action or suspense as expected, but an important and well-done film, co-produced by George Clooney.